A little break from the Christmas cards, as the last two still have to be flung at their intended victims. The weather has been eerily warm here in Ontario the past week, so it had me thinking of pretty soft pastels and florals. Watched How to Marry a Millionaire again today, with my mum. I always loved the glasses Pola (Marilyn Monroe) wore in the movie. Oddly enough the bath robe? she wears is also one of my favourites. A cone strapless bra! It’s a longline bra. I like the stitching, it looks cute. Just another retro car doodle. I’m sorry but I’m going to keep going with this style until it makes us all go crazy. It’s that time of year again. Summer is on its way and with it comes seeing vintage cars on the road again. Here’s a sketch of a ’57 Chevy Bel-air that got a touch of colour. 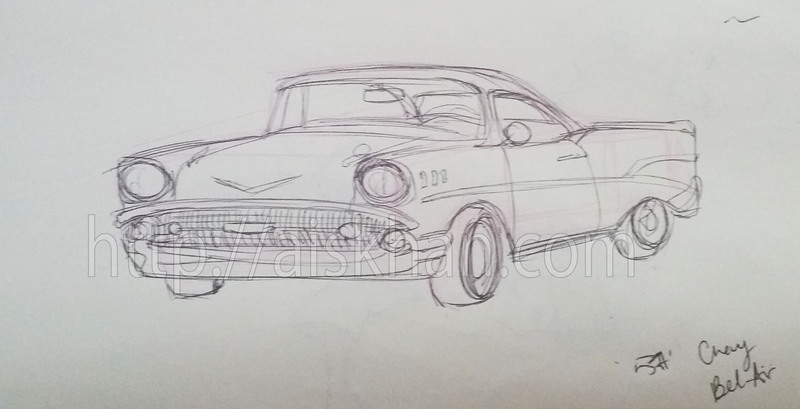 Another doodle of a Chevy Bel-Air. This and the Cadillac De Ville are my dream cars, if only one day I could afford one, and of course learn to drive stick. 0.5 mm Ballpoint Pen, Pink Pencil. 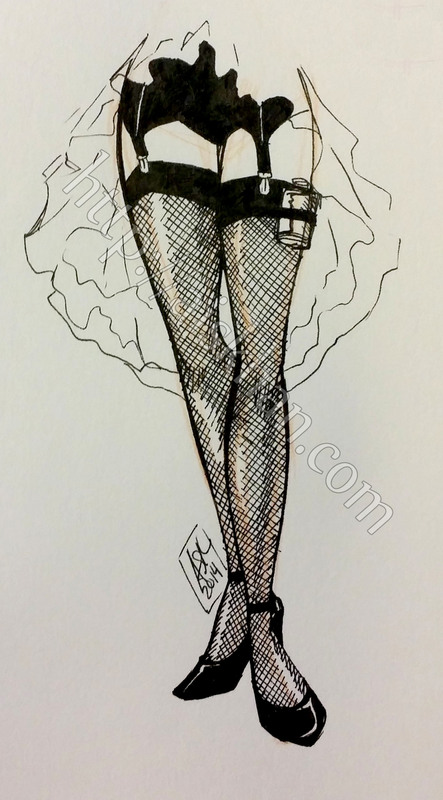 I was just thinking about how garter belts with stockings are way more comfortable than modern day tights, at least for me they are. Anyway, this is the more feminine counterpart of my sock garters post from a while back. Enjoy! 0.1 mm Carbon Ink Pen, Orange Pencil.